VivaImpose: Millions of publications. One program. VIVAIMPOSE is the leading tool for automatic digital imposition. Already on the market since 1995, the program has since then been setting new standards in speed, safety, flexibility and functionality. Developed in co-operation with leading printers in both sheet-fed and web offset, VIVAIMPOSE is able to process documents with a speed and precision which has never before been achieved. It's no wonder then that millions of publications are produced with VIVAIMPOSE every year. Our customers produce books, brochures, newspapers and magazines, catalogues and much more for countless industrial customers such as Microsoft, Audi, etc. and naturally for publishers such as Rowohlt, Fischer, Piper, Ullstein, Springer, Klett, Carlsen and many others. 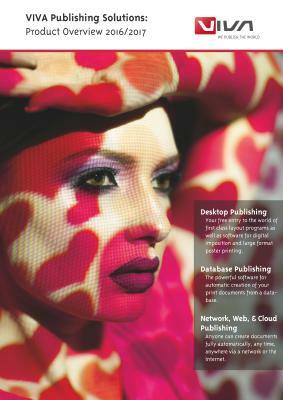 Therefore you will surely at least once have held a printed product in your hand which our software helped to produce! From the very beginning VIVA has followed a completely new and revolutionary path in electronic imposition. The starting point for the development was that our customers wanted to be able to manage the complex technology as simply as possible. Just three simple steps are necessary in the Workstation Version of VIVAIMPOSE to process a job completely in just a few minutes: data import, imposition and output. Only one step is necessary in the Server Version of VIVAIMPOSE to complete a job in seconds: to transfer data to the server, which delivers the imposition fully automatically.